Nebraska Residency and Divorce – Does Where You or Your Spouse Live Matter? Whether a court has power to hear and rule on a divorce depends on the residency of at least one of the spouses. That is, has one of the spouses lived in Nebraska for more than one year with the intention of making Nebraska his or her permanent home? How long do I have to live in Nebraska to get a divorce? Either you or your spouse must have been a resident of Nebraska for at least one year to get a divorce in Nebraska. However, if you were married in Nebraska and have lived in Nebraska for the duration of your marriage, it is not necessary for you to wait a year before you file for divorce. If neither or your spouse meets the residency requirement, other legal options are available for your protection, such as a legal separation, an order of custody and support, or a protection order. Can I divorce my spouse who lives in a different state? 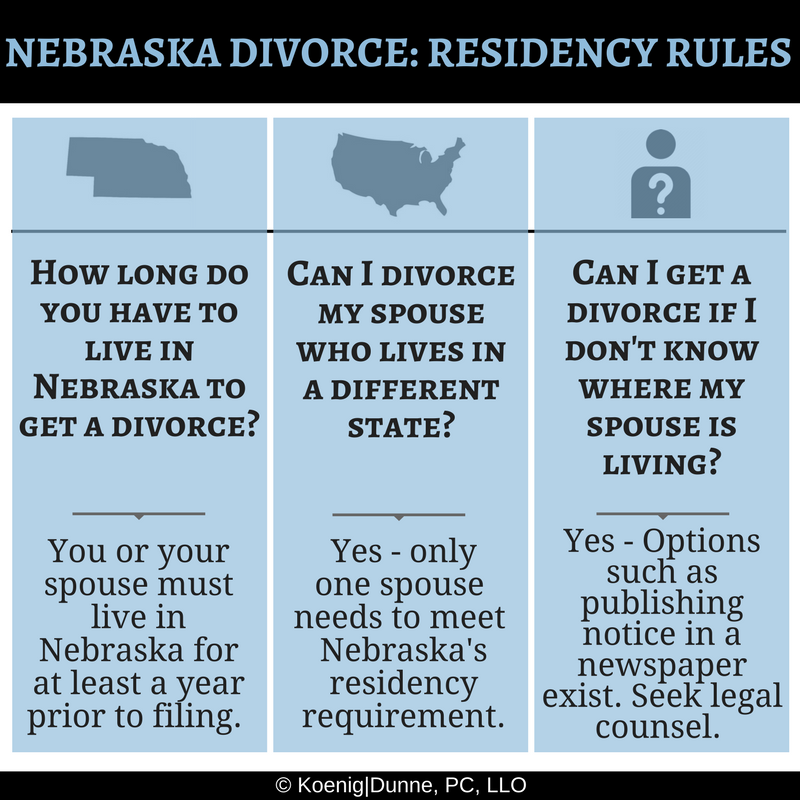 If you meet Nebraska’s residency requirement (living in Nebraska for a least one year prior to filing for divorce), you can file for divorce here, even if your spouse lives in another state. However, you’ll need to work with your attorney to ensure that proper notice of the divorce is provided to your spouse to ensure that Nebraska has jurisdiction over him or her. Jurisdiction is the official power of a court to make legal decisions and judgments over a person or subject matter. You can proceed with a divorce even if you don’t know the current address of your spouse. However, you must first take action to attempt to locate your spouse to provide notice that a divorce action is pending. Tell your attorney about the attempts you’ve made to locate your spouse or any information that may be helpful to find an address for him or her. Once your attorney tries to give notice about the divorce to your spouse without success, it is possible to ask the court to proceed with the divorce by giving notice through publication in a newspaper. However, if notice to your spouse is provided by publishing it in a newspaper, you may not be able to get other court orders, such as those for child support or alimony. Talk to your lawyer to find out what your options are for proceeding with a divorce if you aren’t sure about your spouse’s current address. If you are unsure about whether you or your spouse meets the residency requirement for filing for a divorce, seek legal counsel from an experienced family law attorney to make sure the proper steps are taken to be confident Nebraska has jurisdiction to grant you a divorce.